Click here to register ONLINE for the 2019 event! Our course is VERY flat, probably the flattest you will ever run! In addition, our race is IAAF-santioned through the Association of International Marathons and Distance Races (AIMS) and can be used as a Boston Qualifier. To see a copy of our AIMS certification click here. To view the AIMS running calendar click here. Please note that the race route remains the same year after year. The race begins on Harbour Drive and you will run through South Church Street into South Sound and then onto Old Prospect Road to Prospect Point which is designated the Turnaround Point. There you will turn around and run back using the same route and then turn onto Walkers Road where you will continue until you come to Hinds Way where you will turn right and continue onto Academy Way back to Walkers Road. You will continue on Walkers Road until you come to the 4-way stop at Hospital Road. You will turn left onto Hospital Road and then onto Elgin Avenue in front of the Government Administration Bldg, and run through George Town toward the Town Clock, turning left and continuing to the stop light on Harbour Drive and turn left and return to the Start/Finish line on Harbour Drive. Full marathoners do it all over again! 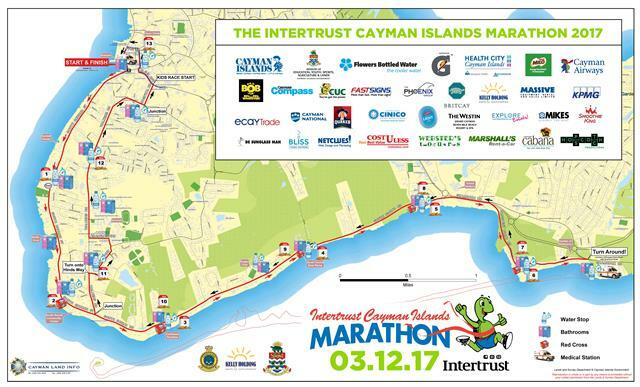 To print a copy of the Intertrust Cayman Islands Marathon course map, please click here.